As autumn marks the start of another school year in Sweden, many students face a choice between public and private school. In the wake of a 1992 school reform, independent schools are growing in numbers and popularity. While many parents choose public schools for their children, an increasing number send their children to independent schools (friskolor). 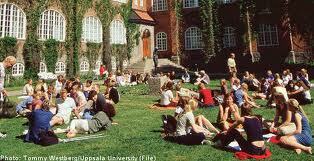 The number of independent schools in Sweden is growing even faster than the children who are attending them. The Independent School Reform of 1992 made it possible for families to send their children to any school — public or private — without having to pay fees. The law states that children have equal right to education regardless of gender, ethnic or political background, and economic status of their families. Several checks are in place to ensure equal conditions for private and public schools throughout the country. Often with a specific focus — such as religion, art, music, or sport — independent schools in Sweden can open as long as they meet the nationwide educational requirements. Once accepted by the Swedish National Agency for Education, the schools receive government funding and must in return not charge any student fees; they are, however, allowed to accept private donations. The growing interest has resulted in consequences that continue to be investigated. Some people have voiced concerns that it will lead to unfair competition between independent schools and more traditional municipal schools, and that some municipal schools may face the threat of closing as a result. Certainly, the new system is sure to gradually open the traditional Swedish model to new alternative methods of teaching. I’d like some private time with a Swede! They are often confused with turnips. Here is a recipe that I am sure Vivienne would be interested in as well. 1.Heat oven to 220C/fan 200C/gas 7. Tip the swede, olive oil, 40g of the Parmesan and the rosemary leaves into a shallow roasting tin. Season and toss well, arranging in one layer. 2.Sprinkle over the remaining Parmesan, dot with butter, then add the garlic cloves. Roast for 30-35 mins, turning halfway through cooking, until crisp and golden. Don’t know about private time. I share mine with a Finn. Very thoughtful of you Gerard. However, I don’t much care for swedes.